In political values ranging from views of government and the social safety net to opinions about immigrants, race and homosexuality, Americans are less likely than in the past to hold a mix of conservative and liberal views. At the same time, ideological consistency – the shares of Americans holding liberal or conservative views across a wider range of issues – is increasingly associated with partisanship, a recent Pew Research Center study shows. This reflects a continuation of trends documented in the Center’s 2014 study of political polarization in the American public. 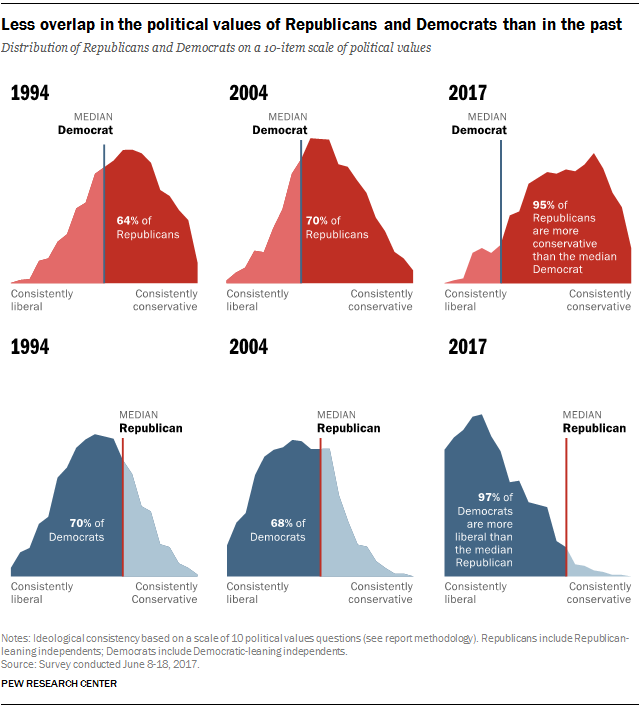 Reflecting growing partisan gaps across most of the individual questions in the scale – even those where both parties have shifted in the same direction – Republicans and Democrats are now further apart ideologically than at any point in more than two decades. The median Republican is now more conservative than 97% of Democrats, and the median Democrat is more liberal than 95% of Republicans. By comparison, in 1994, there was substantially more overlap between the two partisan groups than there is today: Just 64% of Republicans were to the right of the median Democrat, while 70% of Democrats were to the left of the median Republican. Put differently, 23% of Republicans were more liberal than the median Democrat in 1994, while 17% of Democrats were more conservative than the median Republican. Today, those numbers are just 1% and 3%, respectively. 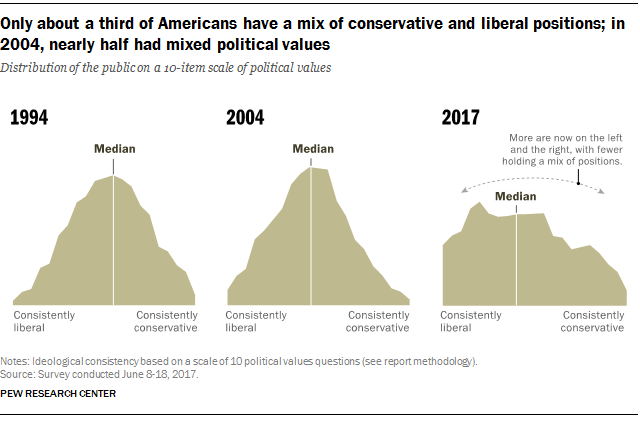 Notably, the mix of political values held by the general public across these measures has shifted somewhat leftward in recent years. Today, across these 10 items, the median American takes four conservative and six liberal positions. In 2011, 2014 and 2015, the median American took five liberal and five conservative positions on these questions. For more information about the scale used in this analysis, including trends on the individual questions asked, see the Center’s recent report about Americans’ political values.